Most Diseases Caused by Medical System? Medical treatments, pharmaceutical drugs and decisions based on wrong information are responsible for causing an epidemic of disease throughout the western world. This is how Nexus Magazine introduces an article by Walter Last, a biochemist and research chemist who worked at several German universities and at Bio-Science Laboratories in Los Angeles. Last analyzes some of the glaring inconsistencies which a unique combination of pharmaceutical funding and a business approach to disease have produced in western medicine. Antibiotics are also a major contributing cause of asthma. Children who received broad-spectrum antibiotics were about 9 times more likely to suffer from asthma. Chemotherapy commonly leads to systemic Candida infections, which greatly limit the success rate of the treatment. Long-term follow-up studies show that children develop 18 times more secondary malignant tumors later in life, girls face a 75 times higher risk of breast cancer by the time they are 40, while the risk of developing leukemia after chemotherapy for ovarian cancer increased 21-fold. Also other tumors commonly develop after treating malignancies with chemotherapy. A main problem appears to be the development of deep or systemic Candida infections shortly after starting chemotherapy. One hundred years ago heart attacks were almost unknown despite diets generally being high in saturated fats. The ascent of heart attacks began with the pasteurization of milk and the use of chlorine to kill bacteria in public water supplies. This began around 1900 and was generally accepted in Western countries in the 1920's. From 1920 onwards the explosive increase in the incidence of cardiovascular disease and fatal heart attacks began, but only in countries that chlorinated their water supplies. These diseases remained unknown, for instance, in Africa, China, Japan, and other parts of ASIA. Health authorities and medical associations have campaigned strongly to avoid sun exposure of the skin. Presumably this causes skin cancer, including melanoma that can kill. However, the vast majority is normal skin cancer that almost never kills, and there is widespread doubt that melanomas are really caused by normal sun exposure, although there seems to be a link with sunburn. Generally outdoor workers with the most sun exposure had the lowest rates of skin cancer and melanoma, while melanomas often show up in office workers. Now more and more research papers show that a vast number of diseases, and especially cancer, could be avoided by greatly increasing our levels of vitamin D with suitable foods, supplements, and frequent or daily short sun exposure of the skin. Sunlight is our main source of vitamin D.
A curios aspect of vaccine safety statistics was highlighted by Dr Archie Kalokerinos. Working in the remote Australian outback with Aboriginals he found that every second child died as a result of vaccinations. Because deaths commonly occurred about 3 weeks later, they were not recorded as vaccine-related; officially reactions were limited to occur only for up to 2 weeks after vaccination. However, eventually Dr Kalokerinos solved the problem by giving babies high doses of vitamin C before vaccinations, and no more vaccination deaths occurred. Also SIDS disappeared. One of the methods increasingly used to denigrate natural therapies is for the pharmaceutical industry to finance shoddy research on natural remedies and then proclaim them to be ineffective or harmful. This is only partly intended to influence the general public but mainly to provide the justification for health authorities to outlaw and greatly restrict natural remedies. Another strategy is not to list favorable vitamin studies in the MEDLINE database. This is taxpayer-funded and operated by the US National Library of Medicine. It lists all articles by medical research journals, including Time magazine and Readers' Digest, but not the peer-reviewed Journal of Orthomolecular Medicine (http://www.orthomed.org/jom/jom.html) which specializes in vitamin research. Walter Last worked as a biochemist and research chemist in the medical departments of several German universities and at Bio-Science Laboratories in Los Angeles, USA. Later he worked as a nutritionist and natural therapist in New Zealand and in Australia, where he is now based. He no longer has a clinic. Walter Last has written numerous health-related journal articles as well as several books, including Heal Yourself and Healing Foods (Penguin). 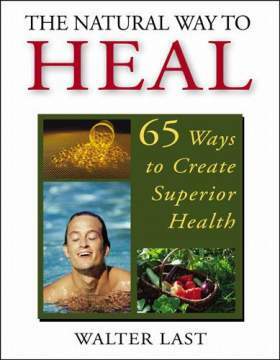 Presently in print are The Natural Way to Heal and the Heal Yourself series - seven small books about overcoming specific diseases such as arthritis, asthma, cancer, candida, diabetes and weight problems. Uso pediatrico - L'efficacia e la tollerabilit� nei bambini non � stata ben stabilita. I can confirm what is written about antibiotics. My son was intoxicated as a baby (7 months) and was in hospital for 10 days where he developed a rash and asthma. The killer antibiotic is called PANACEF, which bears the following information: Pediatric use - efficacy and tolerability in children have not been well established. in italiano esistono dei libri sul cancro?